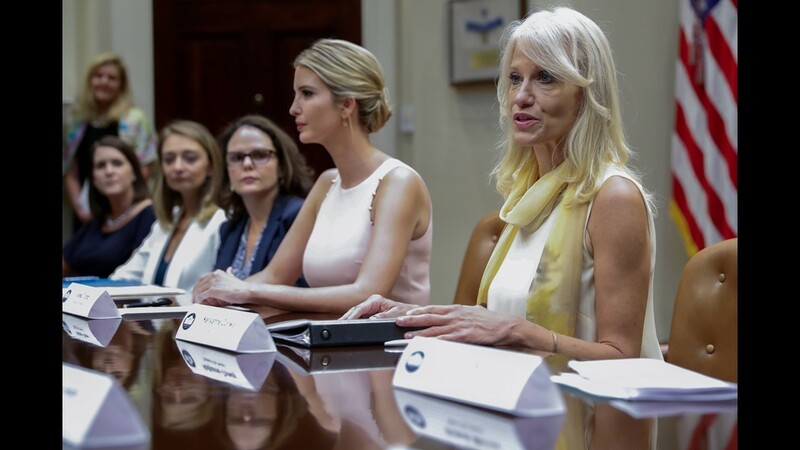 Conway, alongside Ivanka Trump, delivers remarks in a listening session for military spouses in the Roosevelt Room of the White House on Aug. 2, 2017. 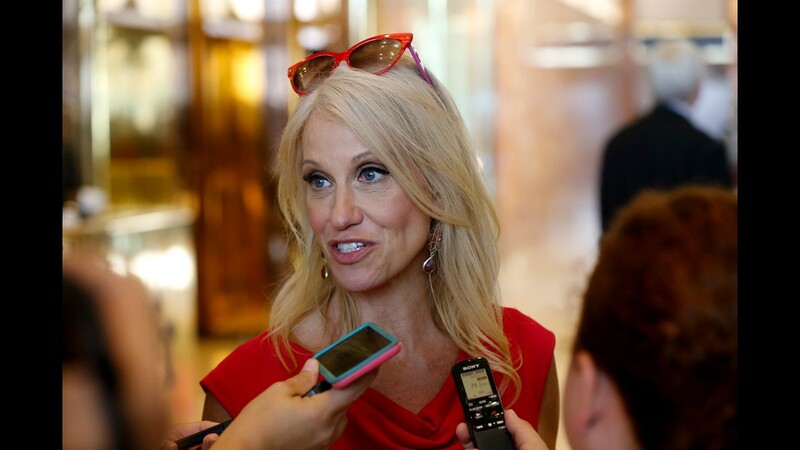 Conway speaks to the media about the Russia investigation outside the White House on July 25, 2017. 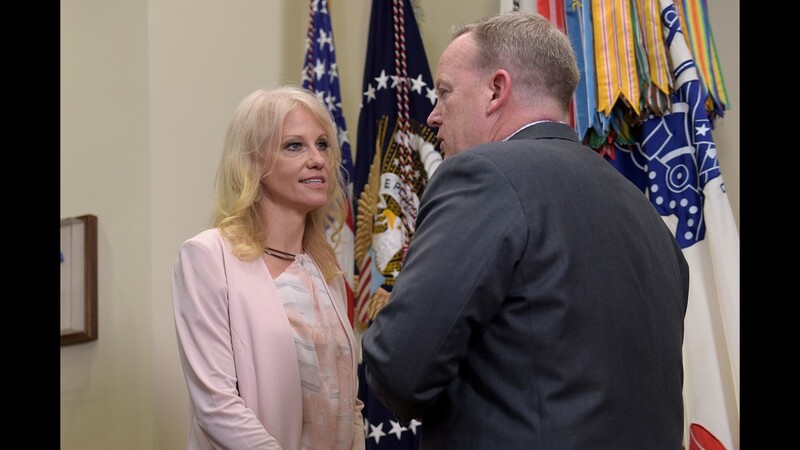 Conway talks with press secretary Sean Spicer in the Roosevelt Room of the White House on June 15, 2017. 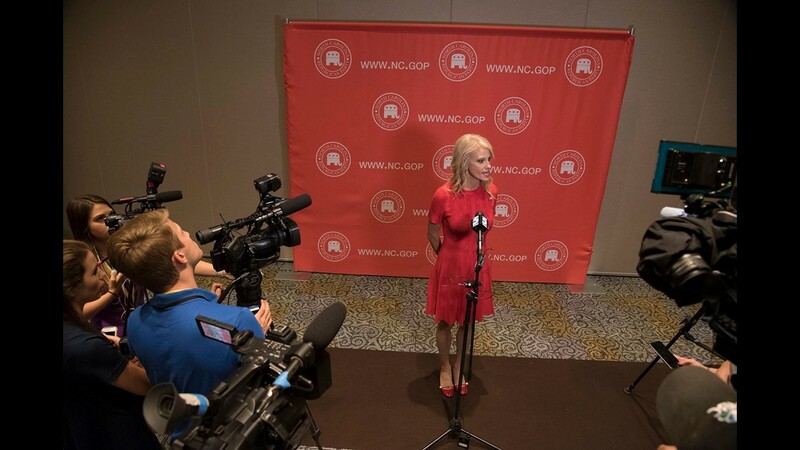 Conway answers a question from a reporter during a press conference at the North Carolina Republican Party State Convention at the Wilmington Convention Center in Wilmington, N.C., on June 3, 2017. Conway speaks during an interview outside the White House on May 10, 2017. 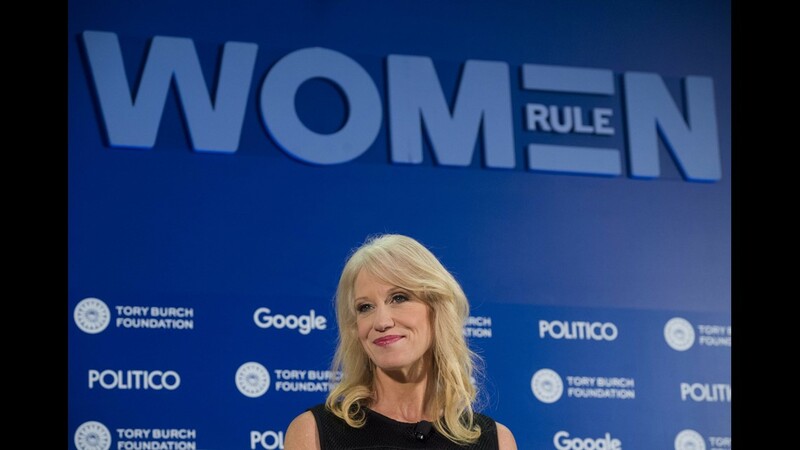 Conway and Maine Gov. 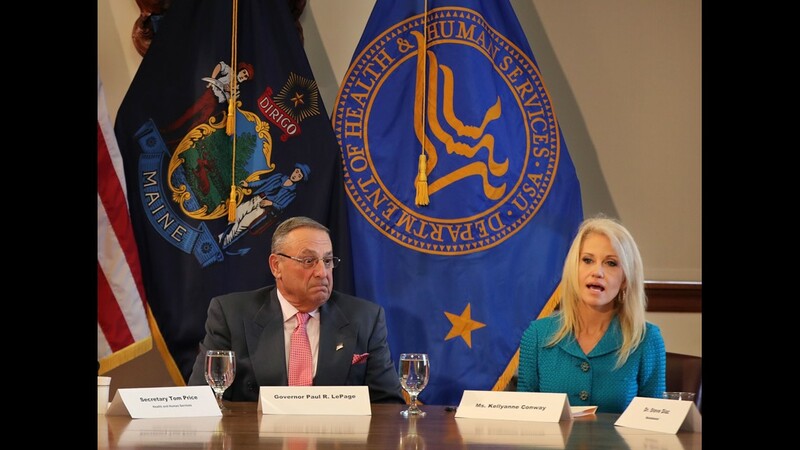 Paul LePage conduct a meeting to discuss the state's efforts to fight the opioid epidemic on May 10, 2017, at the State House in Augusta, Maine. 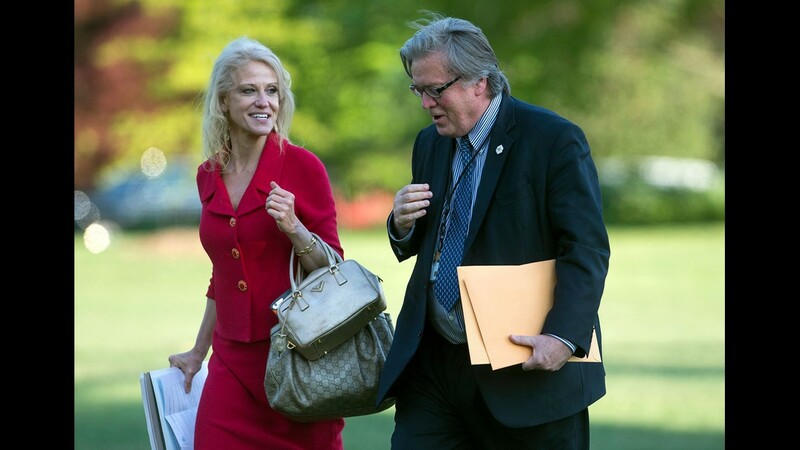 Conway and Steve Bannon return to the White House following a visit with President Trump to Kenosha, Wis., on April 18, 2017. 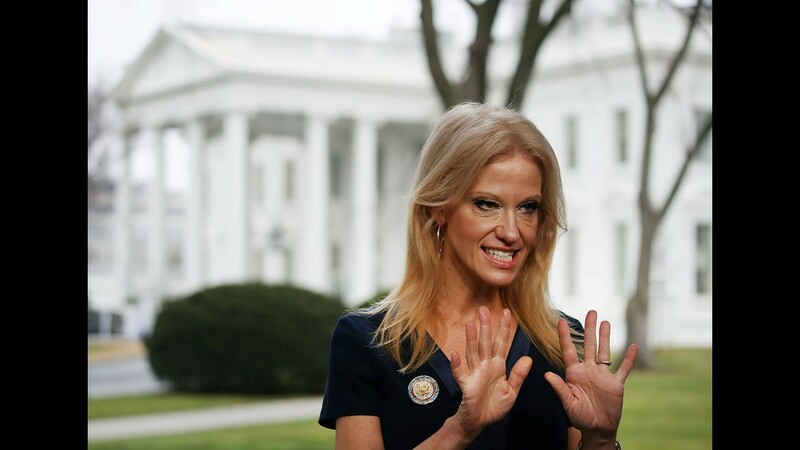 Conway greets guests during the 139th Easter Egg Roll on the South Lawn of the White House on April 17, 2017. 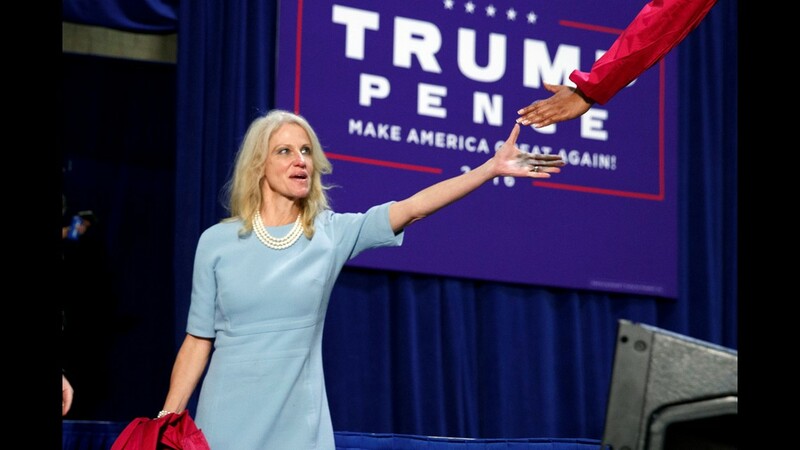 Omarosa Manigault, left, and Conway hold hands as they walk to their seats at the Women's Empowerment Panel on March 29, 2017, at the White House. 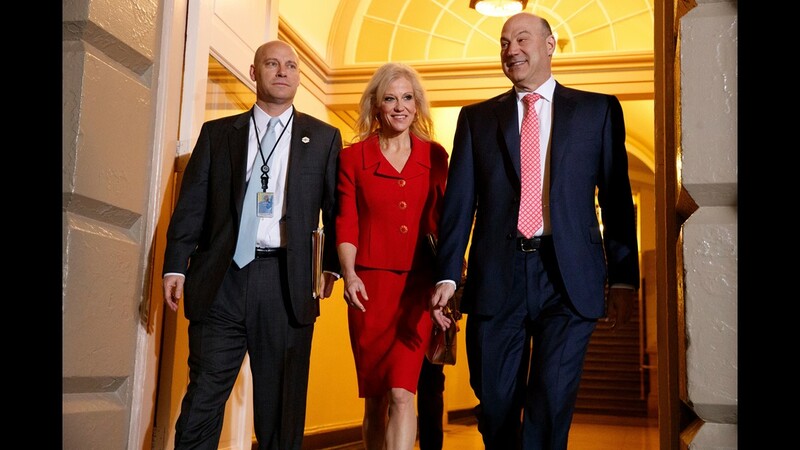 Conway and National Economic Council director Gary Cohn arrive for a meeting on Capitol Hill on March 21, 2017, between President Donald Trump and Republicans to discuss health care. 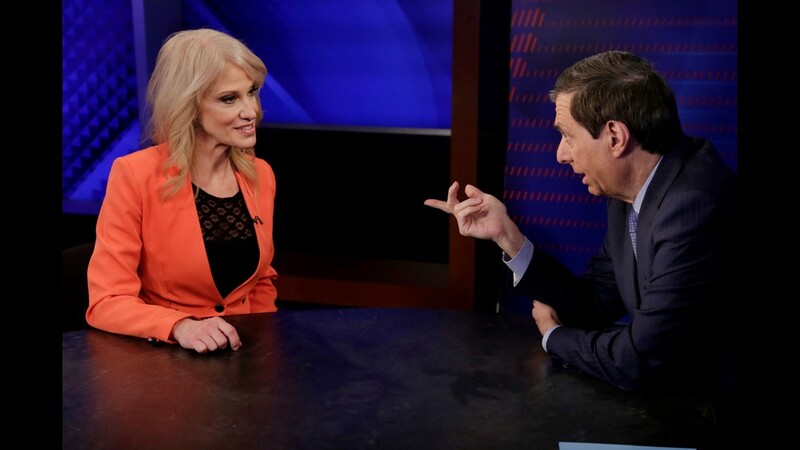 Conway is interviewed by Howard Kurtz during a taping of his "MediaBuzz" program on the Fox News Channel in New York on March 10, 2017. 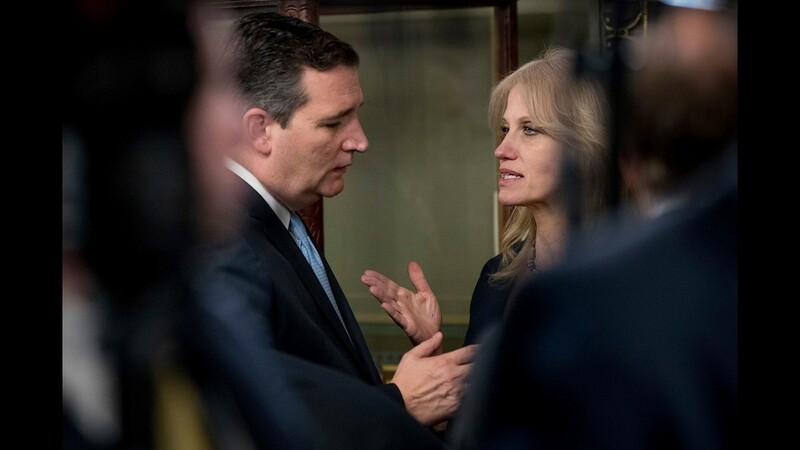 Sen. Ted Cruz, R-Texas, speaks with Conway before Vice President Pence administers the oath of office to Housing and Urban Development Secretary Ben Carson on March 2, 2017, in the Eisenhower Executive Office Building. Conway takes a picture of Trump with leaders of historically black colleges and universities in the Oval Office on Feb. 27, 2017. 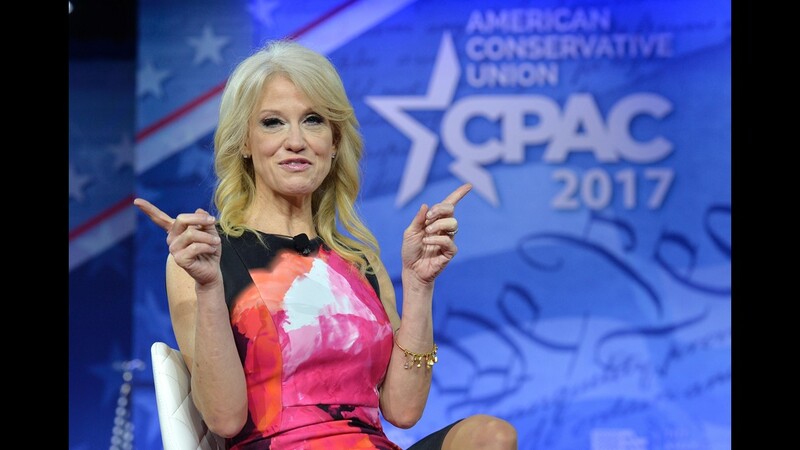 Conway speaks at the Conservative Political Action Conference at National Harbor, Md., on Feb. 23, 2017. 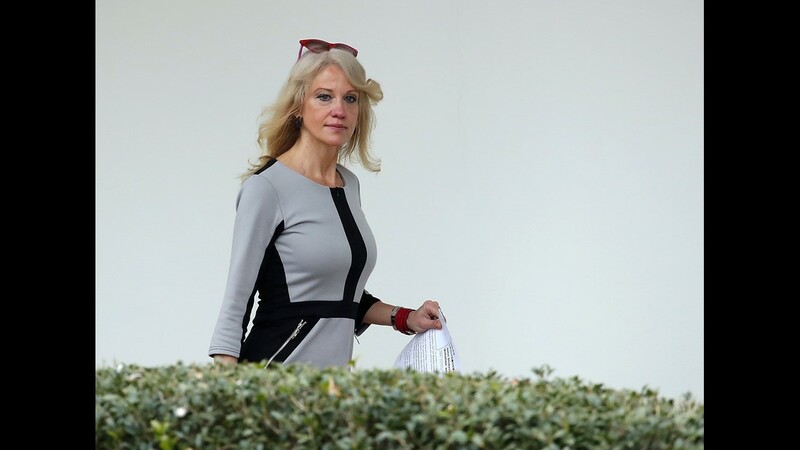 Conway walks along the colonnade before President Trump's departure from the South Lawn on on Feb. 17, 2017. 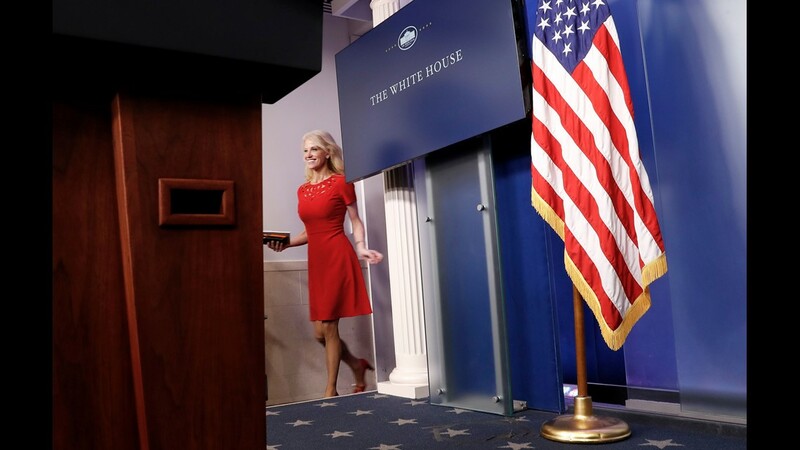 Conway walks in for the daily briefing in the Brady Press Briefing Room of the White House on Feb. 14, 2017. 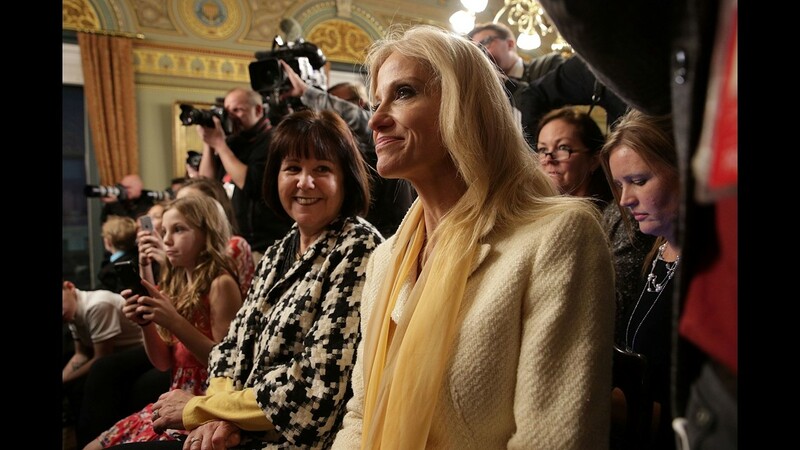 Conway and Karen Pence, wife of Vice President Pence, attend a swearing-in ceremony for Education Secretary Betsy DeVos on Feb. 9, 2017. 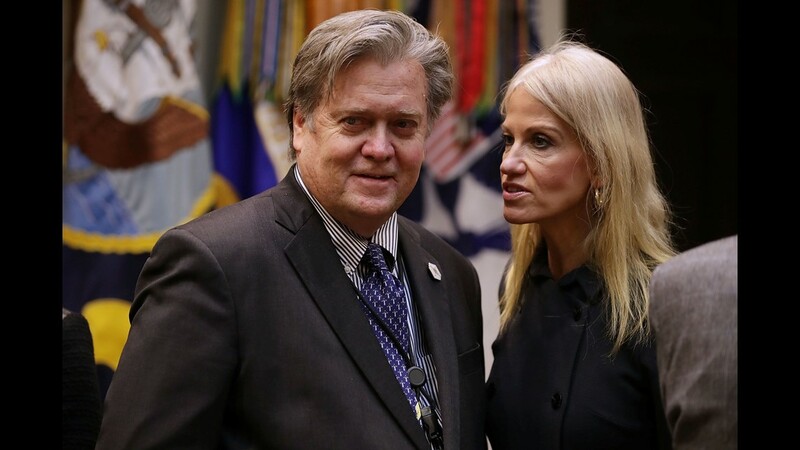 Conway and White House chief strategist Steve Bannon wait for Trump's arrival at a meeting on cybersecurity in the Roosevelt Room of the White House on Jan. 31, 2017. 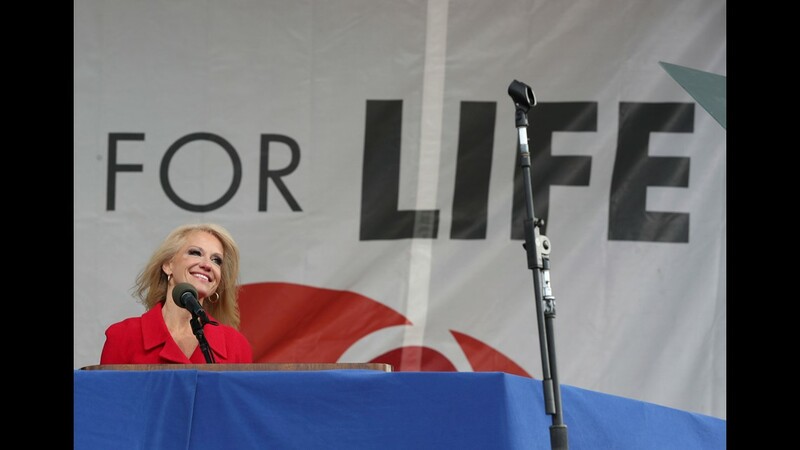 Conway speaks at the March for Life on the National Mall on Jan. 27, 2017. 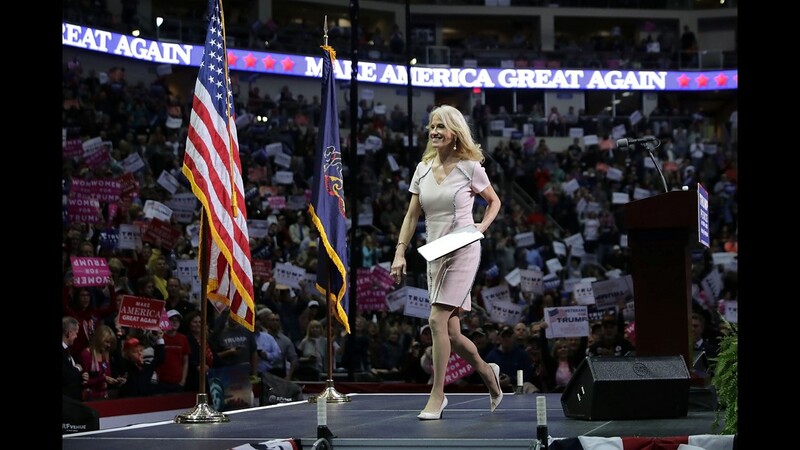 Conway prepares to appear on "Meet The Press" on Jan. 22, 2017. 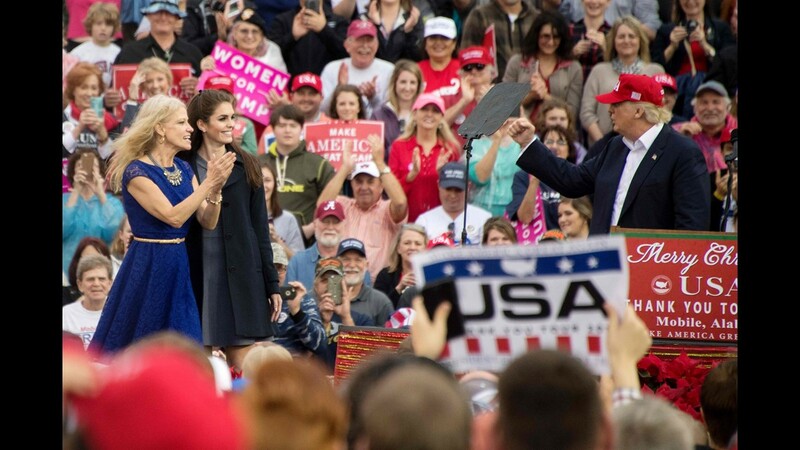 Conway and Hope Hicks attend Trump's inaugural ceremony on the West Front of the U.S. Capitol on Jan. 20, 2017. 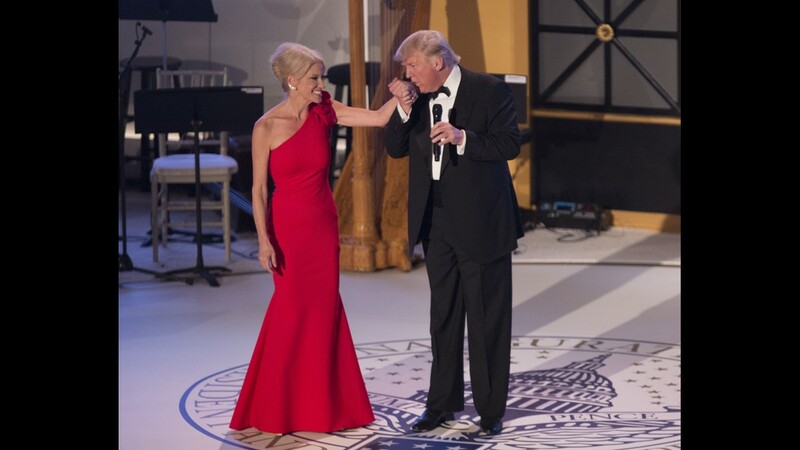 Trump kisses Conway's hand at the Indiana Society Ball on Jan. 19, 2017, in Washington. 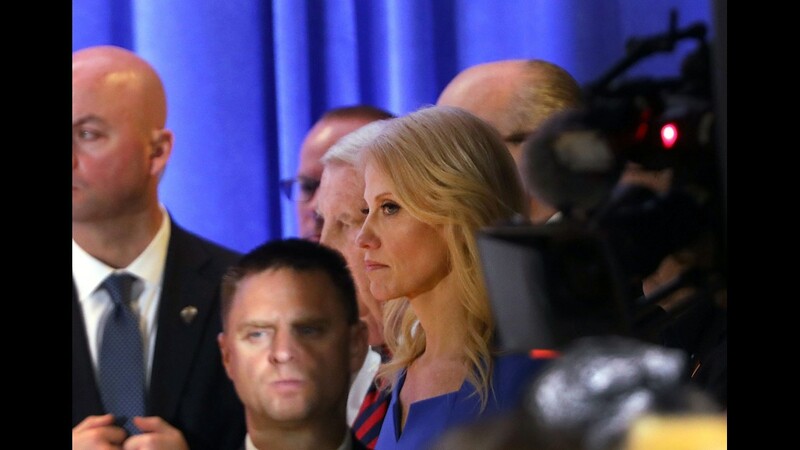 Conway watches as Trump speaks at a news conference at Trump Tower on Jan. 11, 2017, in New York City. Conway and Hope Hicks depart after Trump's meeting at the Condé Nast offices at One World Trade Center in New York on Jan. 6, 2017. Conway and one of her daughters arrive at Trump Tower for meetings with Trump on Jan. 2, 2017, in New York. 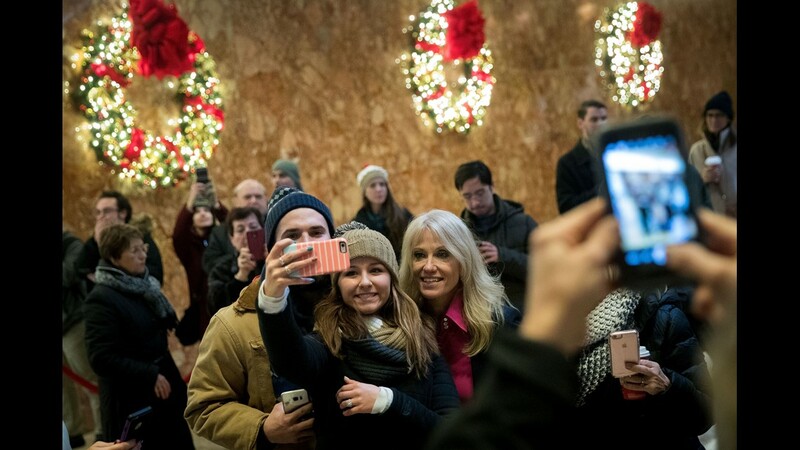 Trump thanks Conway and press secretary Hope Hicks during a rally on Dec. 17, 2016, in Mobile, Ala.
Conway takes a selfie with visitors in the lobby at Trump Tower on Dec. 16, 2016, in New York City. 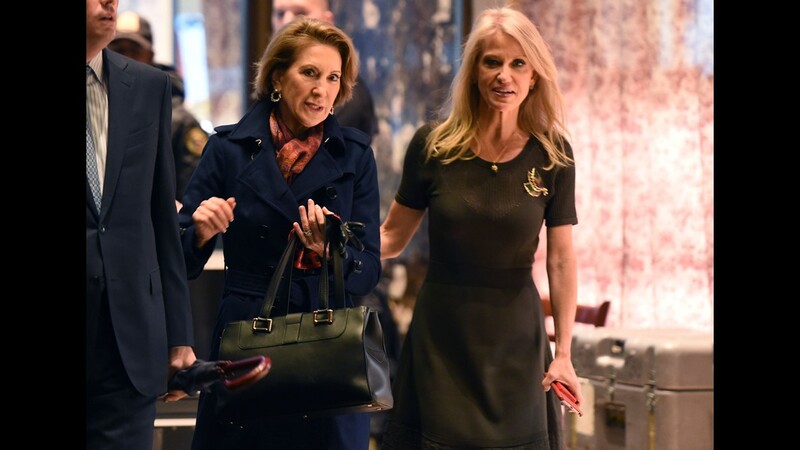 Carly Fiorina meets with Conway as she arrives for meetings with Trump on Dec. 12, 2016, in New York. Conway arrives with family members to the Hammonton Fire Department Christmas Parade, where she was grand marshal, on Dec. 10, 2016, in Hammonton, N.J.
Conway speaks during the 4th Annual Women Rule Summit in Washington on Dec. 7, 2016. 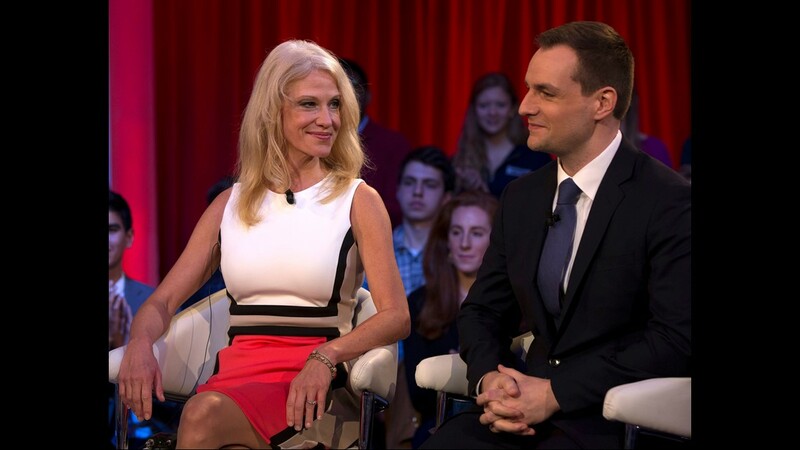 Conway and Robby Mook, campaign manager for Hillary Clinton, at the taping of CNN's "State of the Union" with Jake Tapper at the JFK Jr. Forum at Harvard Kennedy School in Cambridge, Mass., on Dec. 1, 2016. 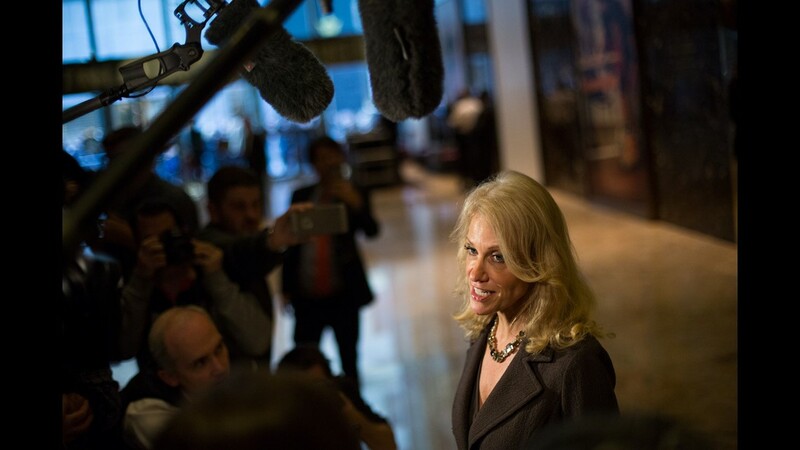 Conway takes press questions at Trump Tower on Nov. 16, 2016, in New York City. 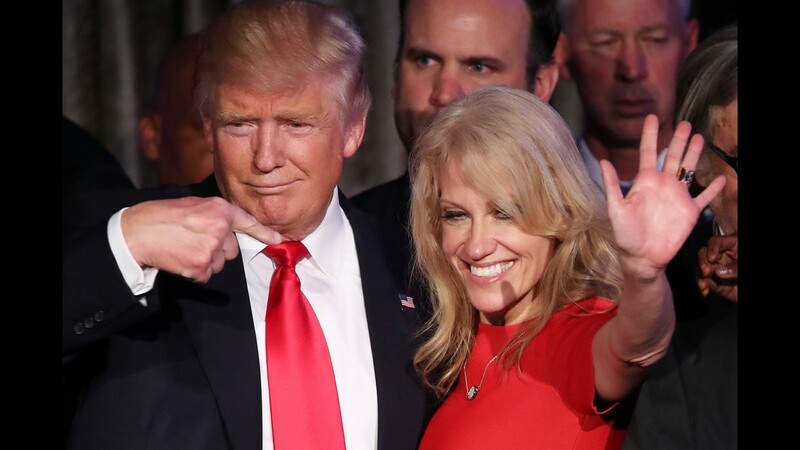 Trump and Conway acknowledge the crowd during his election night event at the New York Hilton Midtown in the early morning hours of Nov. 9, 2016. 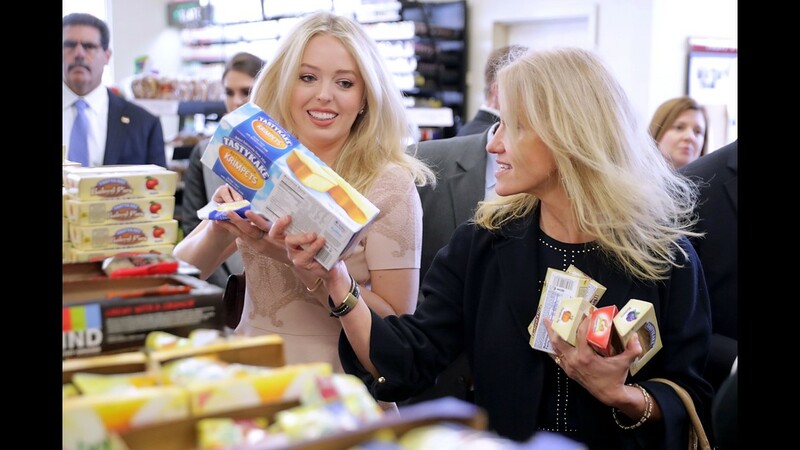 Conway leaves the stage after addressing a campaign rally at the Giant Center on Nov. 4, 2016, in Hershey, Pa.
Tiffany Trump and Conway shop for snack food at a Wawa on Nov. 1, 2016, in Valley Forge, Pa.
Conway shakes hands during a campaign rally on Oct. 14, 2016, in Charlotte, N.C.
Conway talks with reporters in the spin room following the second presidential debate at Washington University on Oct. 9, 2016, in St Louis. 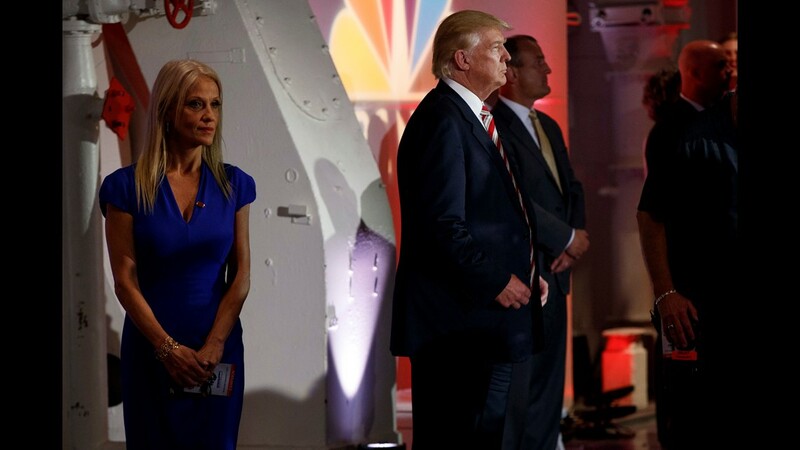 Conway looks on as Trump waits to be introduced during the Commander in Chief Forum hosted by NBC on Sept. 7, 2016, in New York. 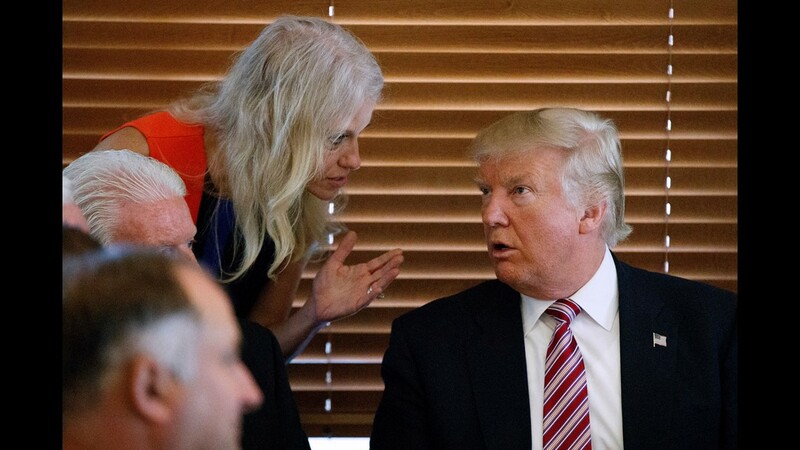 Conway talks with Trump during a visit to Goody's Restaurant on Sept. 5, 2016, in Brook Park, Ohio. 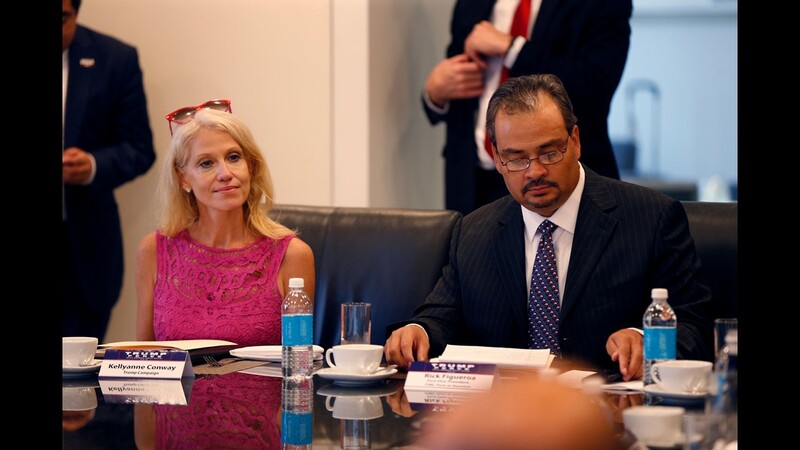 Conway attends Trump's Hispanic advisory roundtable meeting in New York on Aug. 20, 2016. A right is Rick Figueroa, first vice president for FINC Firm of Houston. 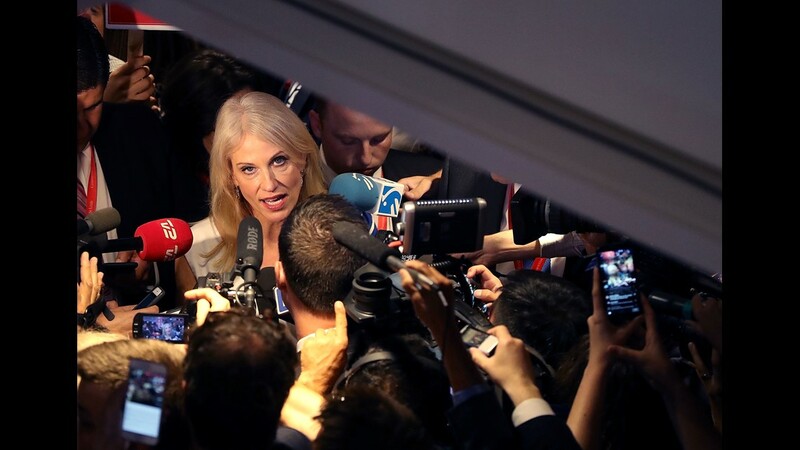 Conway speaks to reporters in the lobby of Trump Tower in New York on Aug. 17, 2016.